300 hours of video are uploaded to YouTube every minute. People can find thousands of videos on almost any topic they choose. Why should they choose you? How will they even find you? You’re ahead of the curve if you’re asking these questions. The vast majority of YouTube videos have only a handful of views. But when you learn how to promote YouTube videos the right way, you can get the kind of traffic that seems reserved for celebrities and huge brands. We’ll show you how. Use these 5 proven ways to promote YouTube videos. Drive unbelievable traffic to your channel. It’s not as complicated as regular SEO (search engine optimization). It’s not as money- or time-intensive as getting your own website to the top of Google. But just like Google search, YouTube has its own search algorithm. Leverage it to get YouTube to promote YouTube videos on your channel without added costs. This algorithm automatically ranks videos. It determines which videos are shown to which people when they sign in or do a search. Apply simple strategies to rank high in YouTube. Simply, knowing that SEO matters on YouTube gives you a strong leg up. The vast majority of channels upload videos and hope for the best. With SEO, you get your videos seen by your target audience. Before you promote YouTube videos in any other way, SEO your website and your YouTube channel. There are many known ranking factors on YouTube. But YouTube doesn’t tell you what they are. Instead, search engine specialists run extensive tests to systematically determine what helps channels and videos appear higher in searches. To this we would add this. YouTube now creates its own transcript of the video. Before, search engines didn’t “understand” the actual content of the video. They only understood how you tagged and described it. This makes spoken keyword phrases as important as written ones. Let’s look at how to apply YouTube strategies to promote YouTube videos through effective SEO. YouTube videos will show up in 2 main searches. They appear on the side or bottom of the screen when someone is using the YouTube platform. They also show up in the Google search results, which is arguably more important. You can gain some fairly extensive insight going the free route. There are also paid tools that will help you get more data on your keyword selection. Use the recommendations function in YouTube. Type a keyword into YouTube search box. Note the suggestions that appear in the dropdown. These suggestions are based on frequent searches. Use Google’s Keyword Planner. Add the word “video” to a keyword phrase. Review the results. Do a Google search on a keyword phrase including word “video”. Note the recommendations. Use free versions of paid tools like Keyword Tool or Moz Keyword Tool. See if videos are on the first page of Google for that keyword. If yes, people are looking for videos on that topic. You have a winner. If not, that’s probably not the ideal keyword. For each video, you need a primary keyword, which will actually be a phrase of 3-6 words. You also need supporting keywords. These are called LSI (latent semantic indexing) keywords. These help search engines better understand the context of your page. And they may also bring the video up if used in a search. Because the YouTube search engine can “understand” your video through your script, it’s important that keywords are spoken during the video. Just like you would in writing, always use keywords naturally. It’s much more important that the video script sound authentic and engaging than stuffing it with keywords. This isn’t a tutorial on how to promote YouTube videos no one wants to watch. If the videos are already created, note this for future videos. And know that if you have a great video, you likely used plenty of keywords without thinking about it. They should be longer than most of the descriptions you see on YouTube. The sweet spot appears to be around 150 words. That’s a couple short paragraphs. Use this space to get people excited about the video. Don’t give the video away. But do be clear what they’ll learn about. After describing the video, use 25-50 words (included in the 150) to invite people to a related piece of content on your website. And/Or share your links to your social media profiles. Never, ever try to sell anything in the description. That would be bad for SEO and make your channel look spammy. Use your primary keywords 3-4 times and your LSI keywords naturally, once if possible. Create an interesting title of 10 words or fewer, no more than 60 characters (including spaces). For best results, put the keyword phrase within the first few words. Add the year in parentheses at the end for people searching for very current content. If the topic is timeless like this one, the date isn’t necessary. For technology, marketing, trends and other time-sensitive topics, the year is a must. For your tags, use your primary keyword and LSI keywords. Never use misleading tags unless you want to see YouTube and Google make your videos invisible to searchers. Yes, it will seem like magic when you do a disappearing act in searches. But this isn’t the way to promote YouTube videos. In order to effectively measure success when you promote YouTube videos, align this action with how you’re measuring success. If you liked our video, you’ll love our channel. Please subscribe and comment. It’s okay to ask people to like on YouTube. It hasn’t become as objectionable (yet) as it has on Facebook. So take advantage while you still can! Use analytics to determine the best way to get people to take actions. We did it indirectly. Most people who like videos, like them automatically. But an added nudge can help take it to the next level. Don’t try to do too much in one video. 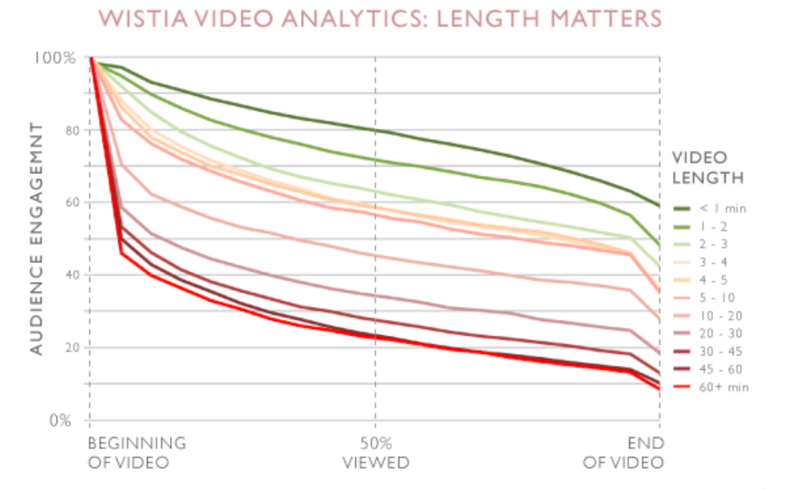 Wistia found that 75% of people will watch a 2-minute video to the end. 60% will watch a 5-minute video. As the length grows, you lose people. You lose ranking in YouTube. They want to know if people finished the video. If a 10-min video makes sense for the topic, do it. But if you can break it up into some 2-5-min videos, it will improve your SEO. If it’s a series, avoid making them too short, under 1 minute. If people have to sit through an ad for each one, they’ll get frustrated fast. Each video should be substantial enough to get likes, comments and links. But it’s short enough to be finished. Watch your video analytics to find that balance. If you need a longer video, add a linked video annotation within the first 1-2 minutes of the video. This is a clickable call to action. If someone clicks it, it indicates to YouTube that the viewer saw all they needed to see even if they didn’t finish the video. A thumbnail is the first thing a person sees. It needs to stand out. A random still from your video likely won’t get the job done. Consider keeping a cohesive theme or branding your thumbnails, so your videos are always recognizable. Create series and related videos. Build content around a list of related (but different) keywords. Think about who your keywords attract. If you’re not attracting potential customers or people who will like and subscribe, that video may not belong on your playlist. Organize content in an intuitive way for your various target audiences. Always, promote YouTube channels through SEO first. When you do, it magnifies the results of any one or more ways you choose to promote YouTube videos. As you drive traffic through other methods like social media advertising, that traffic will be compounded as YouTube and Google make note of how that traffic is responding to the video. On the other hand, if you only apply YouTube SEO strategies and don’t do anything else, you’ll be waiting a long time. YouTube needs some initial traffic with which to judge you. Facebook is one of the best ways to get that traffic. 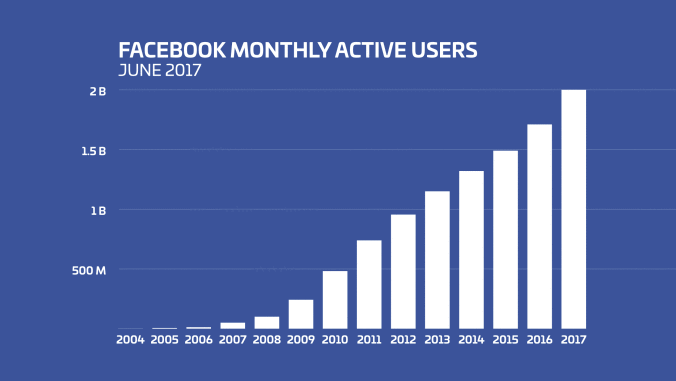 Facebook now has over 2 billion active users. Over 80% of people around the world have a Facebook account. They visit it at least daily for about 32 minutes. 32% of people engage with brands on Facebook as part of their daily routine. For a visual let’s look at a graph from thought leaders Sprout Social. YouTube actually comes in close second with 1.5 billion users. Put these two behemoths together. You can create enormous traffic. Facebook gets over 8 billion video views a day. Also, of note, 85% of users watch video with the sound off when on Facebook. This puts tremendous importance on the visual design of the video. The first 3 seconds deliver 47% of the value of a Facebook video ad. These 3 seconds determine whether someone stops scrolling or moves on by. You must hook people in those 3 seconds. Do the math. 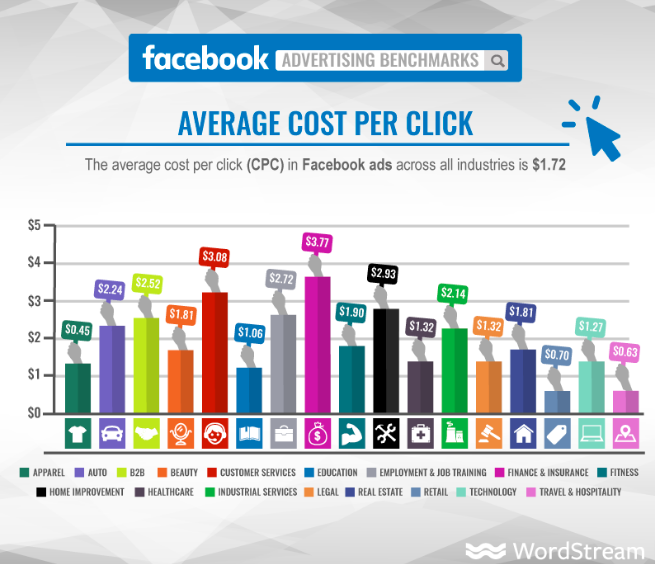 Understand the CPC (cost per click) in Facebook. It varies by industry, but averages $1.76. That would be an incredible expense if you had to pay for every visitor. But remember, since you SEO’d your YouTube first, you’ll be compounding the results of that click. Digital marketing software company WordStream broke it down like this. Consumer services cost the most at between $3-4 per click. Retail is at the other end at less than $1. When driving YouTube traffic, typically you’ll measure acquisition in new subscribers. You might also choose to count any positive action (like, comment, etc) as an acquisition of a new fan on YouTube. All of these help show YouTube and Google that you deserve prime placement in search results. Think this through. Who do you want to target with the video ad? It’s better to reach 1000 people from the right audience than 1 million people who aren’t your target customers. Going too broad can increase misclicks that you have to pay for. It can also generate clicks that don’t have any positive outcome like a like, comment, subscribe or link. Note the choices available to you and how they represent your audience. With Facebook, you can Geo-target. You’ll almost always want to do this. If you’re a local business, it’s a must. But even if you ship worldwide, some markets are more lucrative than others. Shipping to some areas costs more. Focus on the geographical areas where you make the most money. But what if you’re building a professional brand as a blogger or vlogger? You don’t sell anything directly. Do you still need to geo-locate? In most cases, yes. You get the most value out of your clicks when you advertise where your target subscribers are. Use analytics to determine which geographical areas deserve more focus. 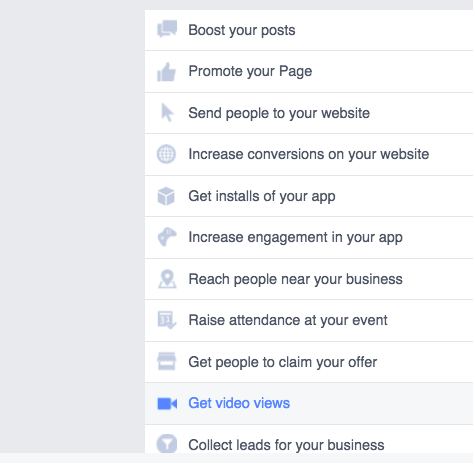 Facebook asks you what the objective of your video ad campaign is. Clearly mark it to get the best results. Since you’re driving traffic to your YouTube Videos, “send people to your website” will likely make the most sense. Your YouTube channel is acting as your own website in this regard. But you’ve others to choose from if something else seems more fitting. This is not to diminish other social media platforms. But whether you’re social media advertising on LinkedIn, Instagram or Twitter, you’ll apply similar ad strategies to those on Facebook. Instead of rehashing it for each platform, we’ve still got 3 more distinct and proven ways to promote YouTube videos and drive unbelievable traffic. Branding is sort of like gravity. We can’t see it. The average person can’t measure it. But you know it’s there because of the results. To promote YouTube videos like a rockstar develop a clear branding strategy. Not having a distinct video intro can kill your chances on YouTube. A 3-5 second intro identifies your brand. As people learn to trust your brand, it gives them a reason to keep watching. They know this will be good. They know who you are. Without an identifying intro, people might watch several videos randomly. They don’t make the connection that one awesome brand is providing all of this content. The intro is super-short and should showcase who your brand is. Use a single font in the video. People will come to associate this font with your brand. Make it distinct but legible. The sizes and colors you choose for the font are also part of font consistency. Don’t just let your video roll into someone else’s. Create a clickable outro that showcases other videos on that playlist. Whether you’re a personal brand or a business one, YouTube and a blog go hand in hand. These days, most content management platforms make it so easy to embed video. There’s no reason not to do it. Blogs allow you to go into more detail than you might in a video. They make it easier to see what topics you’re covering when you use very skimmable headlines. While search engines like Google love video, they sometimes have trouble understanding it on a deep level. The blog can help fill in the gaps for one dynamic pairing. Are you not a blogger at heart? That’s okay. Give your best videos a home on your website. Set it up like a blog so that each “article” is a different video instead of an article. Give the videos a new title and a detailed description similar to the one you gave it on YouTube. But don’t create duplicate content. That may impact the SEO of either your website or YouTube Channel. Put the videos in categories similar to the categories on a blog. Now your YouTube channel leads people to your website. Your website leads people to your YouTube content. Social media and email marketing guide people to both. Everything is working together to build up your traffic and engage people at the same time. For people who admire and/or trust that influencer, this is a very desirable piece. It’s very easy to promote YouTube videos that include people that people know. The name instantly gets attention. Combine that with a compelling description and you can generate unbelievable traffic. Not only will you be able to generate traffic through whichever way to choose to promote YouTube videos like this one. The influencer will also share the content. In many cases, they’ll do it for free. It helps them promote their own brand at your expense so they are getting something out of it. This is one of the more difficult ways to promote YouTube videos for some. It takes some charisma and networking skills. We’ll walk you step by step through initiating an interview request with an Influencer. Don’t just settle on an influencer before you’ve determined what kind of influencer is best for helping you promote your YouTube channel. This helps you avoid a huge mistake when you promote YouTube videos through influencer marketing. That’s ignoring the perfect influencer who “falls in your lap” because you had your sites set on someone else. Start with a set of criteria. These might include number of followers on a social media platform you’re trying to build a presence on. You may be looking for other traits. Influencer marketing software company Klout put together this handy matrix to help you determine what to look for an influencer. Maybe you’re looking for a “Pundit”. This is an influencer who’s opinion really matters. When they speak, the stock market may rise or drop. Other people base their own opinions on this person. This person isn’t in the news. They make the news. Or you may be looking for a “Socializer”. This is a person that’s always connecting with people and sharing how, when and where others should be social or fit in in certain crowds. Or a “Specialist” may serve you better. This person has credentials that automatically make their opinion matter. This isn’t always easy if the influencer is someone big like Daymond John (FUBU, SharkTank) or Dr. Oz (Health Author and TV Personality). Someone else may be managing their social media presence. Try it reaching out through social media. But it may end in a robo-response. If you’re having trouble getting contact info, one of the best ways to connect is the work your way into their circle on LinkedIn. In other words, connect with people connected with them who are “lesser” influencers. Their LinkedIn will usually have a gatekeeper as well. But that person is more likely to patch the message through if your pitch is convincing. Or do it the old fashioned way. Try to connect via phone or social media with people in their circle. Network until you can earn a referral, mention or vote of confidence that gets you into this influencer’s world. Influencers may get 100’s of interview requests a day. Why should they choose yours? Offer value first. Why would this person would take time out of their busy day to talk to you? A free service or product from your company that they’ll care about. If you have a huge influencer in your sites, you may be willing to spend more money to customize the gift. An influencer is never obligated to do the interview or even respond. If you give a gift and they keep it without reciprocating, make a last attempt and then move on. It happens sometimes. If you want to pursue it, continue to work on your value proposition and networking around them. These proven techniques are how the biggest brands drive traffic. And they don’t have to cost a fortune. Work smart. Start with SEOing your channel and videos. Make it easy for people to find what they’re looking for. Leverage the power of social media to reach the right audience. Integrate your YouTube and blog to drive traffic between them. Brand yourself. Interview an influencer. Are you struggling with how to promote YouTube videos on a small business budget? We can help with proven strategies that not only work. They increase your ROI so you can grow as a brand. Don’t settle for no views on your videos. Contact us today.